I’m nervous about how my dog will do away from home. 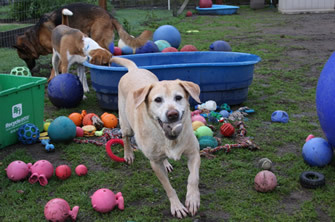 Dog’s are incredibly happy here due to the exceptional facility (huge play areas, clean air, beautiful setting), quality, loving and well trained staff, social environment and personalized attention. Transitions are usually seamless….really! Dogs absolutely hate to be alone and we cater to this need. We are devoted to giving the dog all the attention and affection it needs and this makes for a happy facility. If you have any concerns, we recommend a complimentary visit (day care or boarding) on a Tuesday, Wednesday or Thursday to help you feel more comfortable. W hat do you do when it rains? That really depends on your dog. If your dog loves the rain we will play in it with them throughout the day. For many dogs this is their favorite time of year. 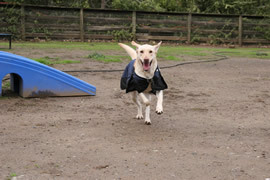 Most owners don’t want to play in the rain so this is a special opportunity for many dogs to experience real joy. For those that don’t enjoy a good downpour, we have covered areas where they can get out of the weather and rain jackets. Once they have finished their business, they can come inside until the rain stops. The rain jackets also help us at night so that clean up before bedtime is efficient. We actually require it! We are passionately committed to safe, happy, active boarding and daycare. We are not interested in packing in as many dogs as possible regardless of appropriateness. Because dogs play and socialize in groups here and because safety and real fun are our primary goals, we need your dog to come in for a behavioral assessment and we’d like to give you a tour of our amazing facility. We will make sure your dog is safe to handle, pet and cuddle as well as safe to interact with other dogs. This assessment is done by appointment. It might sound like a bit of a hassle but it is the key to providing an absolutely amazing experience for your dog. Our safety record is unmatched due to our commitment to this test and safe soft play. Please call us to make a reservation. All reservations must be confirmed by telephone. Our Camp Counselors will be happy to discuss all of the wonderful boarding, training, pampering, grooming, and daycare options Camp Four Paws offers. Holiday and summer reservations should be made well in advance. What should I bring with my dog when I drop him off? Vaccination Record from Vet. We need to see this every time. Food in labeled 1 Gallon Zip Lock Bag(s) - these bags hold 14 to 16 cups of food. Washable Bed (optional) we will give them a soft warm bed and blankets if you don’t bring them. Individualized Focused Training (loose leash walking, polite greetings, down stay, etc), personalized pampering sessions (brushing, cuddling, ear and hip rubbing, massage, etc.) and activity requests should be made at the time of reservation or at check in. Vaccination records showing current DHPP (Distemper/Parvo), Rabies and Bordetella should be presented at the time of check in. Please make sure to get your Bordetella 30 days prior to boarding if not current. We will need phone numbers so that we can reach you while you are away. Special Diets and medications should be clearly labeled with dogs name and amount and times of feeding or dosage. We have multiple freezers and refrigerators for raw diets. A scheduled pick up appointment time should be set when you drop off the dog. Cancellations to a holiday period reservation must be done 14 days ahead of time. Cancellations to a non-holiday reservation must be done 72 hours in advance or cancellation fees will apply. What happens when a dog needs to go to the Vet? Because of our focus on safety, it doesn’t happen much. But, if your dog needs Veterinary care while visiting with us, we contact one of our local Veterinarians. The Vets in our area are all outstanding and can usually get us in immediately. They will contact your Vet for consultation if needed. We may also use a mobile on call service. Are there any dogs you won’t take? Yes, but we do love them all!! 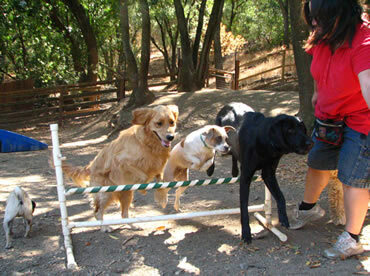 We just recognize that our facility was designed with Sporting, Working and Companion dogs in mind. These dogs were bred to work and get along in a group even in heightened states of arousal (ball chasing, duck retrieving). Not all dogs can do this and it’s not fair to expect them to. We are sorry to say that this system doesn’t work well for all breeds including all those historically (not necessarily presently) bred to be tough as well as some others. We love them all but our facility and methods are not appropriate for all dogs. Also, again, for the safety and fun of the play group, all dogs that play here must be spayed or neutered in accordance with our guidelines. Will My Dog Come Home with Different Urination habits? They may improve! They absolutely will not under any circumstances deteriorate! We guarantee it! We have been informed by some of our customers that their not quite potty trained dogs improved after their stay here. The dogs at camp potty outside on grass, dirt or small soft round pebbles, not cement or tile. Your dog will come back home with well practiced good behavior. All dogs urinate and defecate outside here so we will be helping you maintain good habits. Thank goodness! Please note the owner of the facility lives here. This place is her love and her passion but she needs her own time and space too. Please always have an appointment and respect our hours of operation. Please also respect the grounds of the facility as this is her home, not just a dog facility. Having an owner on site gives a heightened level of security, oversight and an unmatched level of care and protection but we need to take care of her too!